With the recent frosts sending the last leaves clattering to the ground it is time to do something with them. I am lucky that, although there are lots of broadleaved trees around the place, most of those around the lawns, and thus the most annoying, are oaks. Oaks (quercus), along with beech (fagus) make the best leafmould because of their high tannin content and high dry matter (complex carbon compounds). It does, however, mean they take the longest time to ‘break down’. A pile of leaves will take a long time to decompose, especially if dry, and decomposition is speeded up by making them moist and faster still if some nitrogen is added. Whether you are composting leaves or other material it helps to make a good mix of ingredients. I liken this to our diet. The dry, high-carbon, bulky matter is equivalent to fibre in our diet; the wet, high-nitrogen, soft matter is equivalent to protein (which is also high in nitrogen) in our food. Eat too much protein at the expense of fibre and, with no bulk for our intestines to get hold of, constipation and bad smells ensue. 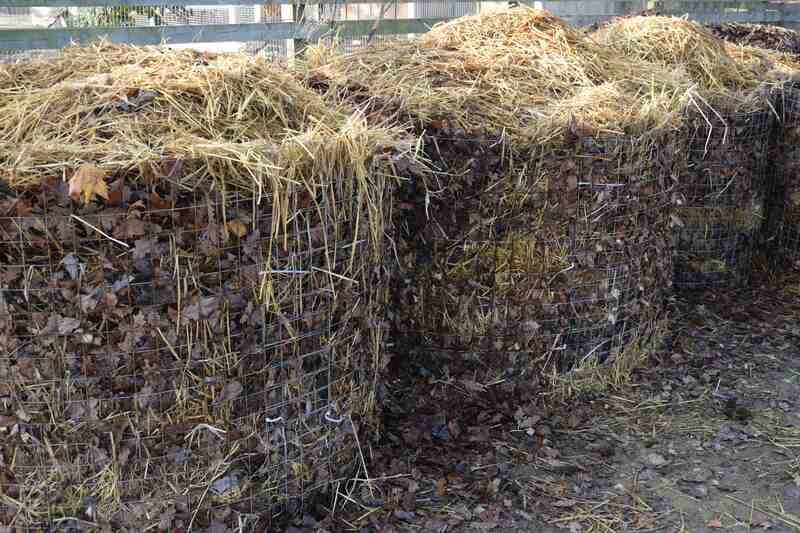 A compost heap must have lots of bulky, high-carbon matter, which will be the bulk of the heap, and some wet, high-nitrogen material that will keep the heap moist and feed the bacteria that will cause the decomposition and build up the heat to kill pathogens. I had lots of fresh strawy manure from mucked-out stables so have been mixing that with the leaves. Where possible I have mixed these with grass cuttings but I am still a bit low on nitrogen in the heaps so will add some hoof and horn. I have been making ‘bins’ out of wire mesh. They are about 1.2m in diameter and 1m high which is just about perfect. 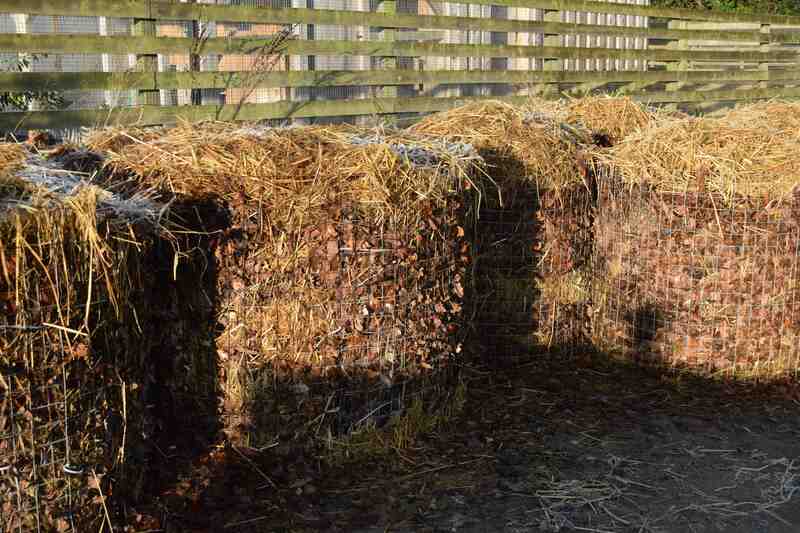 It is important that the material in the heap is well aerated – without oxygen the bacteria we want will die – which is why grass cuttings on their own become a nasty, slimy pile as the heap collapses and air is excluded. Mix with leaves and you have a perfect mix. 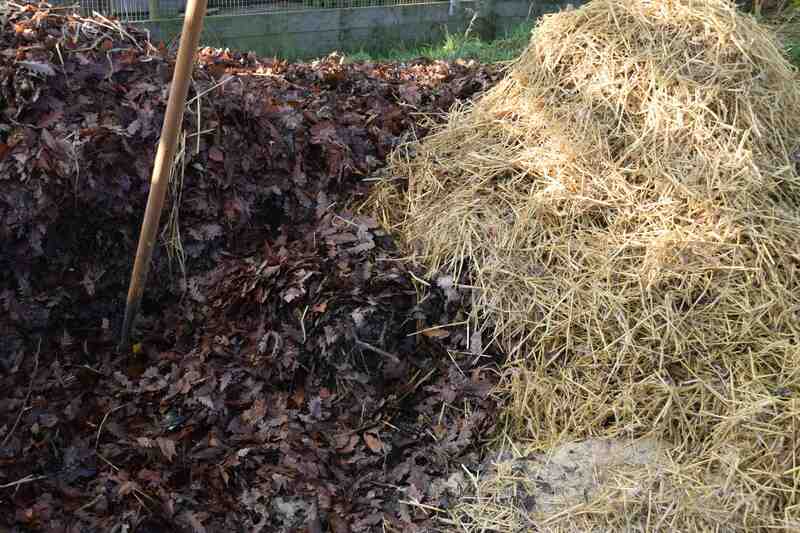 Anyway, I mixed the leaves and strawy manure (there is some chicken manure too) and filled the bins, firming as I went. Fortunately the leaves are wet after all the rain and the heaps quickly heated up and the level fell by about 15cm in the first two days so I topped each with more straw. The other day, when it was frosty and sunny it was gratifying to see the heaps working away with steam rising from them. 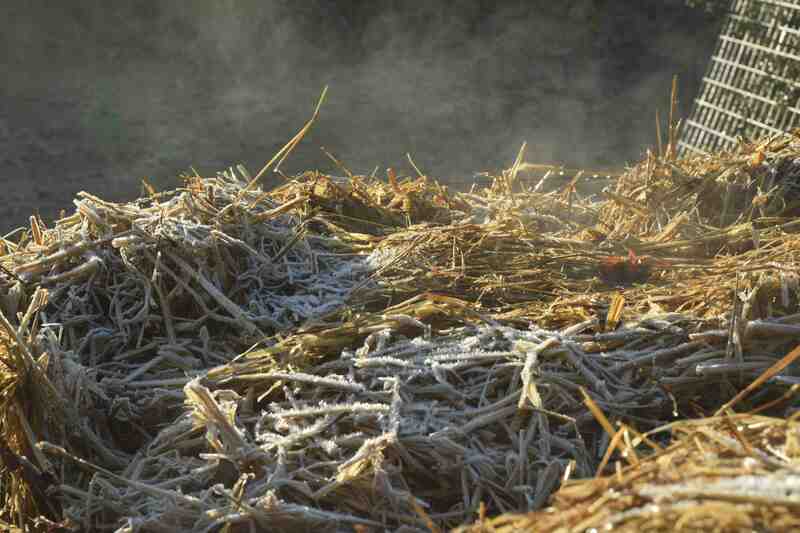 The straw tops were supposed to help insulate them but even so, in the centre, the frost had not developed – it was almost tempting to plunge my hands right in to thaw them, till I remembered was was making the heat! In an ideal world I would turn these heaps in spring and leave them for another six months and use the compost next autumn. In practice I will probably empty it out and use it as a mulch in spring. I also compost leaves and weeds. Thanks for the interesting post! Cheers! Thank you. I put leaves and straw in separate bins because they take longer to break down but some soft weeds go in – waste not want not! I have not seen bins like yours before and I wonder whether they are difficult to extract the compost from? Wire bins are not perfect because the sides do not insulate the material so the outer ‘stuff’ will not ‘compost’ as well as if the material was in a wooden or other insulated bin. But they are cheap and quick to make for all the leaves I have. It is easy enough to get the stuff out – just cut the three cable ties and I can then store the netting until I need it again. But in a small garden it would not be so easy – they are best if you have an area around the bins so you can ‘unfurl’ the bins.